It's that time of year again...the egg season. No doubt next week you'll be boiling up a bunch of them in preparation for a visit from the Easter Bunny. So I thought it would be a great time to talk about the perfect method to accomplish that task. There are a lot of different ways you can boil an egg. But there are only a couple that will leave you with "the perfect boiled egg". So what constitutes a perfectly boiled egg?? It's soft, not rubbery. It's slightly moist, not dry and crumbly. It peels easily, instead of falling apart. And most importantly, there is no dark brown or green circle around the yoke. A few years ago when I was trying to figure out how to boil eggs, I turned to the one source that I was pretty sure wouldn't let me down; Julie Child's herself! Below is her method, and I promise as many times as I've used this method it has never let me down. 1. You can boil any amount from 1 – 24 eggs at a time. Just be sure to use a large enough pot so the at the amount of water will cover the eggs by at least 1 inch of water. 2. Lay the eggs in the bottom of your pot and add the amount of needed cold water as stated above. 3. Set the pot over high heat and bring to a boil. Once it comes to a rolling boil; remove it from the heat, cover the pan, and let sit exactly 17 minutes. 4. While the eggs are sitting, prepare a bowl of ice water. 6. While the eggs are cooling, bring the pot of water back to a boil. 8. Remove the eggs, and place back into the ice water. Allow to chill for 15-20 minutes. *chilling the eggs after each step prevents that dark line from forming around the yoke. Chilled eggs are also easier to peel. Now that you have the perfect eggs for decorating and hiding...What to do with all those eggs? Make lunch!! This is my favorite egg salad recipe. It's simple, but yummy. 1. In a small bowl combine the mayo, Dijon mustard, lemon juice, and paprika. Mix well. 2. Add the chopped eggs, celery, onion and parsley. Fold to combine. *If you're not a fan of raw onion, try adding diced radishes. They add a wonderful crunch and a bit of spice without the overpowering aftertaste of onion. I have never enjoyed a hard boiled egg that had a greenish-grayish ring....yuck! I need to try this method....I have always simmered my eggs for 10 minutes and then dumped them into cold water...but have had some troubles with peeling them. Guess I have to put them back into the boiling water again! Egg salad and deviled eggs are some of my fave recipes around this time of year. I am excited to try Julia Child's method of BOILING an EGG - as you can see by my excitement is that I've never had that perfect egg. Thanks for the yummy egg salad. I will be making this very soon! Welcome Nancy! Thanks so much for stopping by my blog. I love it when people comment. Feel free to comment or ask questions any time. Wow we must be on the same wavelength!!! I just did this for a "did you knwo that wed"! Haha! 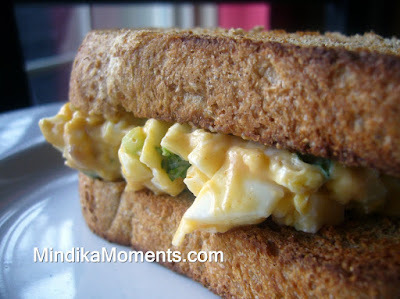 I haven't had an egg salad sandwich in a long time. Yumm! 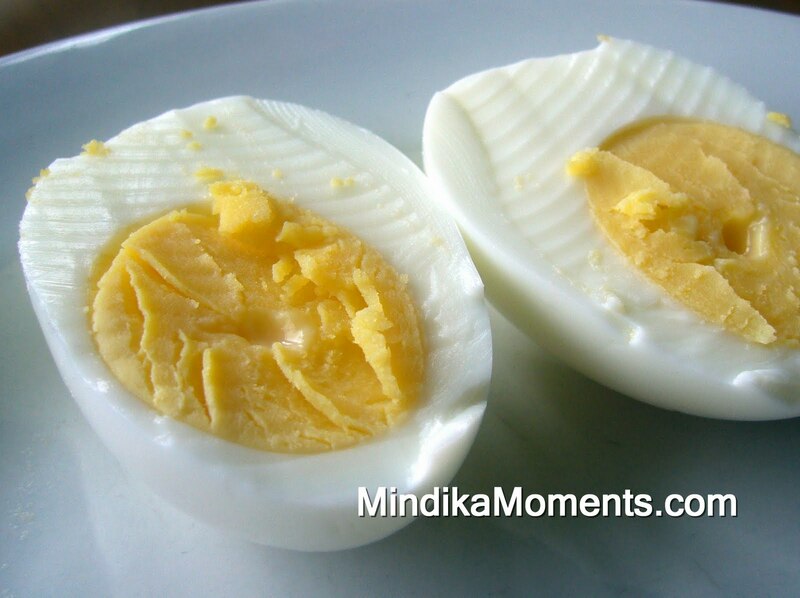 I will be trying this method next time since it's been hit and miss with my boiled eggs lately. Who wants to eat a deviled egg with the ugly ring? Thanks for the info.! We are coloring our eggs today. . . and we'll eating them over the next few days. Hooray for the Omegas! There is one trick that I know to get a more centered yolk if you are doing deviled eggs. The night before put your egg on its side the yolk will settle over night and be centered.